Arcata resident Seth Jones landed a nice Smith River king salmon on Wednesday while fishing with guide Mike Coopman. The Smith dropped into perfect shape on Wednesday and should continue to kick out large kings through the weekend. Last week’s deluge was just what our rivers — and our salmon — badly needed. 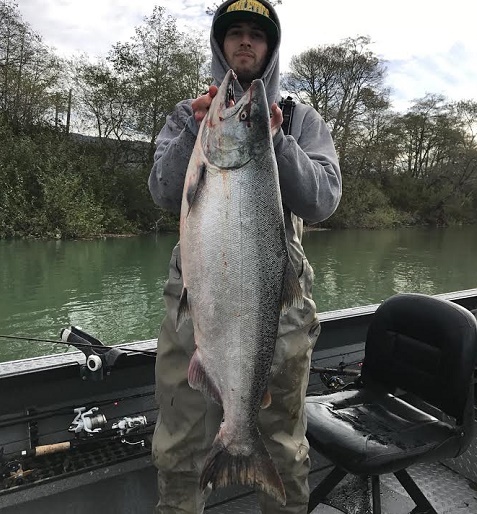 From the Chetco to the Eel, all of the rivers saw huge flow increases, allowing the late run of fall kings to make their way from the estuaries upriver and closer to their final destinations. Fishing on the Smith started out slow early this week as the water levels started to come down to fishable levels. By Wednesday, it was game on. The Chetco is dropping quickly, and should fish by Thursday. I’d expect to hear some really good scores by Friday. The Eel, Van Duzen and Mad all remain off color, but plenty of salmon were spotted moving through these rivers last week. More rain is in the forecast beginning this weekend, so the salmon fishing should only get better. The CDFW projects that the Upper Trinity River anglers will have met their catch quota of 183 adult fall-run Chinook salmon above Cedar Flat by sundown on Friday, Oct. 21. Starting Saturday, Oct. 22, anglers may still fish but can no longer keep adult Chinook salmon over 22 inches in the Trinity River above Cedar Flat. Anglers may still keep a daily bag of two Chinook salmon under 22 inches. The fall-run Chinook salmon quota on the Lower Trinity River is 183 adult Chinook salmon from the confluence with the Klamath River up to Cedar flat. 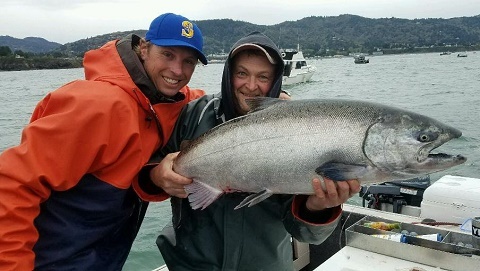 This sub-area quota has not been met yet, and anglers may retain one adult Chinook salmon as part of their two fish daily bag limit. Anglers may keep track of the status of open and closed sections of the Klamath and Trinity rivers by calling (800) 564-6479. More rain is in the forecast starting on Saturday night according to Reginald Kennedy of Eureka’s National Weather Service. “Light rain is in the forecast for Saturday night, with up to a half-inch falling. The rain will be heavier on Sunday, with the Smith and Eel basins seeing upwards of an inch and a half. The South Fork Eel area could see up to two inches. Showers are in the forecast for Monday, with another half to an inch predicted. We could see a combined total of one to two inches for Tuesday and Wednesday. Right now the models are showing we’ll be dry Thursday through next Saturday,” Kennedy said. The Sixth annual Klamath River Steelhead Tournament is scheduled to take place on Saturday October 29. Check in will be from 7 to 8:00 am at the liquor store in Happy Camp and weigh-ins will be at the bulk plant river access at 5 pm. The boat with the largest steelhead measured in length will win the competition. Drift boats only and no motors are allowed during the competition. You can fish any stretch of the river you like as long as you are checked in by 8 am and at the weigh-ins by 5 pm. Shuttles will be available and can be scheduled at check in and will cost $20.00 per vehicle. For more information, contact Mario Gomez at 530-598-0530. Crab traps must contain at least one destruct device made from a single strand of untreated cotton twine, size No. 120 or less, that creates an unobstructed opening anywhere in the top or upper half of the trap that is at least 5 inches in diameter when this material corrodes or fails. Destruct devices prevent the continuous trapping of organisms in lost or abandoned trap gear, in a process known as “ghost fishing. Crab trap buoys must display the “GO ID” number of the operator of the trap. The GO ID number is the unique, 10-digit identifier assigned by the Automated License Data System to your profile. Crab traps must not be deployed or fished seven days prior to the opening of the Dungeness crab season. For this upcoming season, crab traps used to take either Dungeness crab or rock crab can’t be used or deployed in state waters from October 29, 2016 until the Dungeness crab fishery opens at 12:01 a.m. on November 5, 2016, and any crab traps found in ocean waters prior to this seven-day period should be removed from the water by October 28, 2016. This is to prevent the unlawful take of Dungeness crab before the season starts. To read the entire regulation changes, visit here. The catch and release of Chinook salmon is legal on the Eel and Van Duzen Rivers, but keeping them is prohibited. 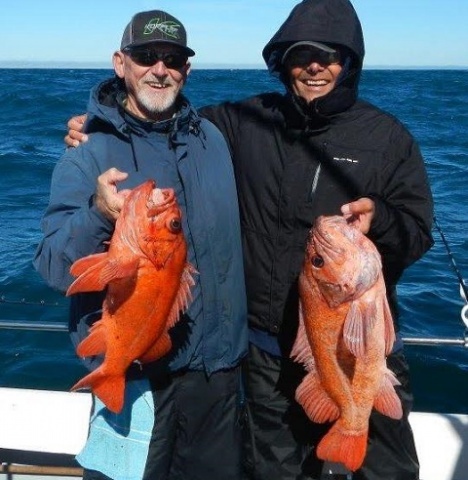 As a reminder, anglers should do everything in their power to ensure the fish they catch are released in good condition so they can complete their long, hard journey to their spawning grounds. Not removing them from the water and using a rubber mesh net is recommended. Barbless hooks are required. On the Mad River, targeting salmon is prohibited. Running below 7,000 cfs on Wednesday. It should fish around mid-day on Thursday according to Andy Martin of Wild Rivers Fishing. “Loeb Park, Moffit Rock and Ice Box will all fish at 5,000 cfs,” Martin added. The CDFW will make the information available to the public no later than 1 p.m. each Monday, Wednesday and Friday as to whether any river will be closed to fishing. The rivers can be opened up at any time. The low flow closure hotline for North Coast rivers is (707) 822-3164. The main stem at Scotia was running at 4,000 cfs as of Wednesday. According to Fred Grundman of Grundmans Sporting Goods in Rio Dell, there’s still a lot of water coming down off the hills and likely won’t fish by the weekend. “There’s a small chance it could be fishable at the top, but I wouldn’t count on it,” Grundman said. Dropped below 500 cfs on Wednesday and could close before the weekend. According to Grundman, it’s still pretty dirty and probably won’t fish before it starts to rise next week. As of Wednesday is was running at 650 cfs and dropping quickly. Flowing at just under 700 cfs on Wednesday afternoon and just starting to turn olive. It’s forecasted to rise on Sunday, but could be fishable by Saturday.